Erdogan’s goal is to become the sultan caliph who brings back the glorious days of the Ottoman Empire. For him, democracy is a street car to ride to his destination and then discard. When Mustafa Kemal Atatürk, the first President of Turkey (1923-38), abolished the sultanate and caliphate following the collapse of the Ottoman Empire, did he imagine that the military he left behind would have to intervene over and over again to restore order? Yes, more than likely. The former general and his supporters had to build a strong dam to change the flow of Turkish social and political currents. The river of centuries of theocracy that poured forth during the Ottoman Empire did not want to flow in the way of democracy. Since then, the presence of the mighty Turkish armed forces cast a menacing shadow over Turkish politics. After almost a century, that long-time presence is on shaky ground, as suggested by recent and dramatic events involving an attempted coup to remove President Tayyip Erdoğan. But sorting out facts from dominant media narratives about the attempted coup in Turkey is not easy. Here are some important things to keep in mind. In its short history of ninety-three years, modern Turkish politics has witnessed three coup d’etats and a pseudo-coup—or “post-modern coup” as some call it. In 1960, amid fears that Prime Minister Adnan Menderes intended to establish closer ties with Moscow, the generals took control of the government. Menderes was found guilty of high treason and was executed. In 1971, the Turkish economy was plagued with recession and there was social division between left-wing movements and Islamist and ultra-nationalist factions. That time, instead of rolling out the tanks, the military issued a memorandum to Prime Minister Süleyman Demirel to restore order. Demirel resigned, but eventually martial war was declared. The chaos, the coup, and the aftermath eventually led to the 1980 military intervention because of ever-increasing violence. The civilian government was overthrown, the Constitution was suspended, and all trade unions were banned. The military junta reaffirmed the Kemalist ideals. Even though an emergence of Islamist ideology has always haunted the Turkish political climate, the only military intervention that was overtly against Islamist elements was the post-modern coup of 1997. Bear in mind, the previous coups took place in the height of the Cold War, where any political or social rapprochement with the Soviets were swiftly suppressed. However, the Welfare Party and its leader Necmettin Erbakan promoted a return to Islamic roots of Turkey, favoring rejection of the negative influence of the West. His party’s influence over the years increased so much so that, Erbakan himself received an ultimatum from the military after a limited show of power with tanks rolling out in one of the suburbs of Ankara. Erbakan did resign in 1997, but he managed to leave a Turkey that was a little farther away from the Kemalist ideals and a little closer to the Islamist world view of the Welfare Party. The previous military interventions came after long periods of social unrest. During the early and late 1970s, there were assassinations every day while factories lost workers and left-wing students clashed with nationalists in the streets. The people needed relief from political chaos. When the elected government could not deliver, the only option was the military, which still possessed the trust and loyalty of people. 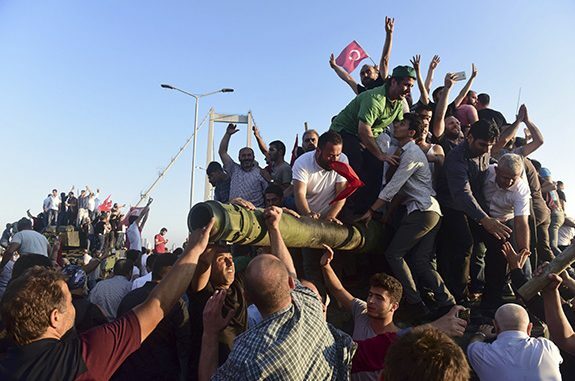 On the other hand, when the tanks started to show up in the streets of Ankara and Istanbul on the night of July 15th, no such desire for intervention preceded. Even though President Erdogan had managed to suppress freedom of speech over the years, he was clever enough not to incite general unrest. When the first pictures of the coup started to appear on TV, the first thing that struck me was how feeble the whole affair looked. Turkey has the second largest military in the NATO. But the soldiers that walked along the tanks looked as if they were out for a night stroll. The overwhelming military presence of the previous interventions were nowhere to be seen. I was a seventeen year-old disgruntled atheist when the post-modern coup of 1997 occurred, but I vividly remember thinking: “If this is what they can unleash in a small town, what else can they do?” The sheer numbers and fierce determination demonstrated then were enough to persuade the Islamist prime minister to resign. Not this time. Even to my civilian eyes, it was clear that this coup was a weak attempt. Surely enough, in a matter of hours all the generals and commanders condemned the coup and declared their support for the democratically-elected government. It should be noted that during the last decade Erdogan systematically eliminated the high-ranking officials of the military who were not sympathetic to his pro-Islamist, pro-Ottomanist vision of Turkey. Erdogan has been in power for almost fourteen years, and he undermined the prospect of a successful coup while replacing the law enforcement and judiciary ranks with those who are willing to facilitate his rise to power. This attempted coup came at a perfect time, when Erdogan’s desire to institute a presidential system similar to that in the U.S. could finally be realized. Since last Friday, the death toll has risen to almost 300. Nearly 6000 members of the military are under custody, hundreds of judges and prosecutors have been arrested, and professors from several universities were removed from their positions and taken under custody. Erdogan’s goal is to become the sultan caliph who brings back the glorious days of the Ottoman Empire. For him, democracy is a street car to ride to his destination and then discard. He is more like a Muslim Putin than an Ayatollah, and now he has all the excuse and support to carry out the changes he wants. One of the things Erdogan did not waste time to do was to blame his nemesis Muhammed Fethullah Gülen for the coup. Gulen, who currently resides in Pennsylvania, has long been regarded as the face of an Islamist reform movement. Erdogan insists that the U.S. extradite Gulen, despite lack of evidence that Gulen was involved in the coup attempt. Was the Gulen movement within the military responsible of this feeble attempt? It is possible, as there were rumors there would be purge of Gulenists from the armed forces. So perhaps it was one last effort to topple Erdogan before it was too late. At the same time, Kemalists in the military argue that it was Erdogan’s own government who staged the coup. Gulen seems to agree as well. The bombing of the parliament, the miraculous incompetence of the F-16 pilot who managed to miss the giant presidential palace, the uninterrupted internet access and media broadcast all bring the authenticity of the coup in question. Since Erdogan has been extremely cunning and clever in removing opposition in the previous years (more than a thousands journalists were either imprisoned or lost their jobs for daring to criticize the president), one cannot completely disregard the theory of a staged coup. Regardless of how this coup came to be, its consequences for Turkish politics and society will have long-lasting consequences. There is no doubt that Erdogan will and has been using it to consolidate his own power—but there is more than that. The supporters he called on through the FaceTime app to pour into the streets and resist the military became uncontrollable masses. They lynched and slit the throats of soldiers who surrendered. They walked the streets of Ankara chanting for Sharia. They have targeted Alevis, a minority Shiite sect in Turkey. They are not only anti-militarist, but also anti-opposition. Unlike what many in the Western media have stated, Erdogan’s supporters are not the “civil society” but are the masses who have no qualms about going after alcohol consumers or destroying monuments dedicated to victims of ISIS. As I watched the young conscripts being beaten by the masses mobilized by Erdogan, there was no part of me that celebrated the victory of “democratic” forces. It looked as if the river was about to break free. Mustafa Kemal tried to create a more modern and secular humanist country through coercion. However, modernity was not a strong enough ideology to stand against the powerful currents of Islam. Once again, the power of Islam was underestimated in politics, and once again the world can do nothing but stand on the sidelines to watch a country’s descent into madness. The face of Turkey changed last Friday. We have yet to see how much.